I have some pretty awesomely silly and fun friends! One of my best friends in the whole wide world is Kim. We did cheesy-as-all-get-out showchoir together in high school and for the last 16 years (yikes!) she has been like a sister to me. Ten years ago, Kim married the Yin to her Yang, Jonathan, and this year they decided that they wanted to do something super fun and silly for their anniversary, so they planned a trip to Vegas to renew their vows in Graceland Wedding Chapel with none other than THE KING HIMSELF officiating the ceremony. Phil and I were SO IN for this, and drove up to meet them in Vegas for a weekend. Kim loves all things vintage, and wears victory rolls in her hair like all the time in real life (she is a h.s. theatre teacher, after all...she has to have a bit of flair) so we decided to dress up early 1950's for the vow renewal, and it was a BLAST! 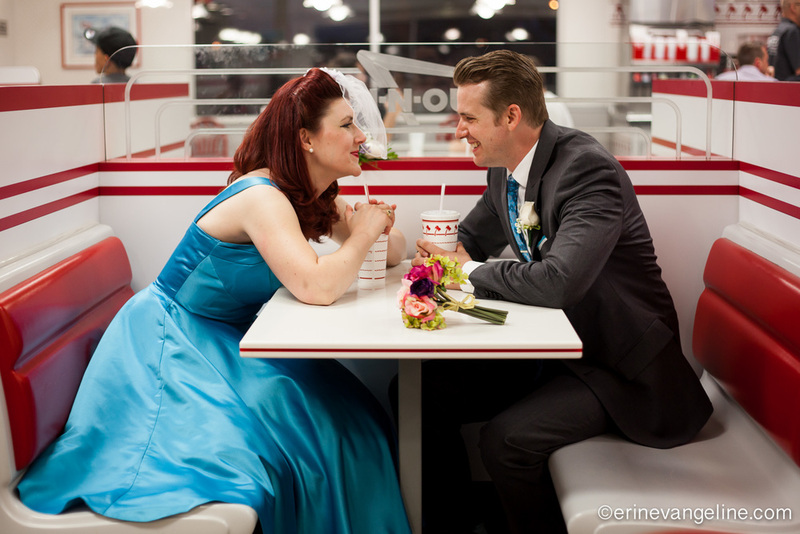 If you ever get the chance to go out in Vegas decked out to the nines, take it and run with it, and dance in the streets, and find you an Elvis to renew your vows. You will not regret it! 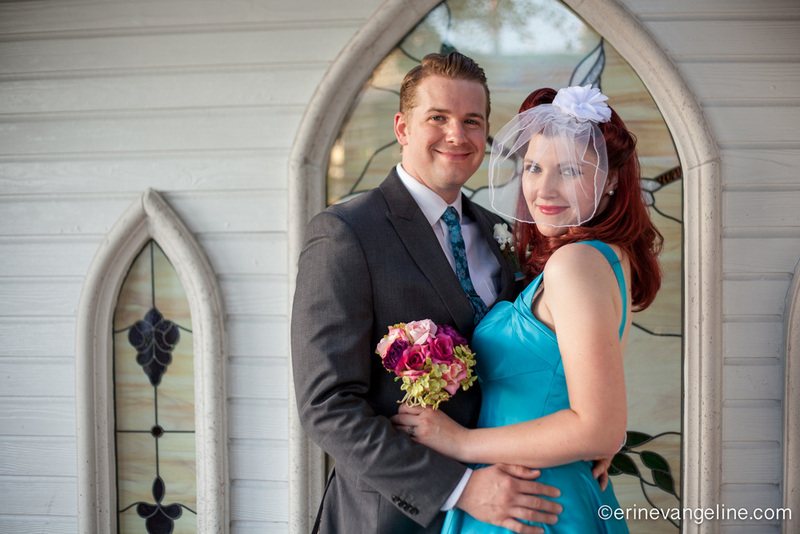 Here are my faves from the photo session that we did on the way and at the chapel, and the fun at the post wedding highfalutin' dinning experience. You don't want to miss these! There was this massive photo of the Rat Pack in their hotel hallway, and lighting be danged, I was going to make it work! Respect to the past! The view from our hotel was bomb!! (Do people still say "bomb?") This one is my favorite!! The Desert sun can be pretty harsh, but these two knew how to werk some sunglasses! Okay, this one might be my favorite, I lied before! Unfortunately I wasn't allowed to take any photos in the actual chapel because they have an in-house photographer named Abe (who was super cool, hey Abe!) and don't allow outside people to take any photos. But let me tell you, it was so much fun, and I think when Elvis had them promise to be each other's "hunk a hunk a burning loves", and "never leave each other at Heartbreak Hotel", I felt a little teary. And since it is a well known fact that Vow Renewing makes you super hungry, we stopped off at the local watering hole known as In and Out Burger so that Kim could experience it for the first time. YUM!! Okay, this next black and white image is kind of fuzzy, and kind of weirdly composed, but look at Jonathan's face... You guys, that is the way he looks at Kim all the freaking time. After ten years of marriage, I swear, he is still puppy-dog-so-very-flipping-in-love with her and I know this because I see this look on his face ALL THE TIME. It's the same way he looked at her the first time we ever went to post-bar pancakes at IHOP in college, and to see it now, in this booth on this night was just so special, so I had to include this photo. Ahhh... I LOVE LOVE!!! On the way home we took a little detour to stop off by the Welcome to Fabulous Las Vegas Sign and took a few super quick shots. I wanted to share them so that you could see the amazing job Kim did on my hair! This was one of the most fun nights ever, and I am so glad that Kim and Jonathan allowed me to bring my camera along on the wild Vegas ride! You guys are so great, and here's to the next ten years. We are going to have to outdo this for your 20th!! !